David Littlefield is a Senior Lecturer and Programme Leader at the University of the West of England, Bristol. A six-week immersion into the design and making of large-scale geodesic and tensegrity forms exposes students to a double meaning – the creation of a structure in the sense of the arrangement of parts; and the structure of thinking and method that implies process. The project makes room for risk-taking, error, and even frustration - while encouraging students to have faith in underlying principles. At UWE Bristol there is a strong emphasis on making within the BA (Hons) Interior Architecture programme. This emphasis comes to the fore in the six-week structures project, undertaken in year 2. This academic year (autumn 2017) students worked in four groups of three, and one group of four. Groups were given the choice of two structural types – geodesics or tensegrity. Geodesic structures, such as those famously pioneered by Richard Buckminster Fuller, enable the creation of facetted, spherical (or part spherical) surfaces through the repetition of two-dimensional shapes such as triangles, hexagons and pentagons. Tensegrity structures, also developed by Buckminster Fuller and others such as David Georges Emmerich, enable compressive elements (such as lengths of metal or timber) to be suspended independently through a tension web (such as steel cable or elastic bands). In this project, two groups opted for geodesics; three for tensegrity. Six weeks later, students were assessed against two main criteria: the demonstration of understanding of the structural type; and the elegance of the structure in terms of detailing, use and appropriateness of materials and finish. The project offers something of a break from designing a proposal that will remain unrealised; with the structures project, forms of considerable substance do get built. The process and results are highly visible; students on other programmes witness the agonies and small triumphs of progress; and the structures stand as testament to the tenacity, skill and spatial ambition of the students. These are large structures which are designed and assembled over an extended period of time. Everybody sees. As a project, it emphasises process, resourcefulness, teamwork, consequences and the many possibilities that be found within the same set of parameters [Fig. 3]. Creating geodesic or tensegrity structures is relatively straightforward at a small scale, after much practice, and if you follow the rules. However, as structures become ever larger, moving from the model to something more akin to a prototype, the consequences of scale become ever more challenging: materials need to become stiffer, heavier, and more difficult to work; junctions require greater sophistication; and accuracy becomes ever more important as even small errors compound themselves after many repetitions [Figs. 4 & 5]. Figure 4: As the project progresses, students increase the scale of their investigations from small, hand-held maquettes to larger studies. At this middle scale, students move to more robust materials in order for the structures to retain their integrity. Figure 6: Mid-sized geodesic structure, composed of card surfaces clamped along flanges with bull-dog clips. These clips were insufficient for the full-scale structure, however. Students were asked to demonstrate their understanding of the principles at work via small models, and select a particular form for manufacture at a large scale. When increasing the scale, students began to substitute dowel for toothpicks, steel cable for elastic bands, and cross-laminated card for paper [Fig. 6]. Connections shifted from knots in string and bull-dog clips to hex-nuts and heavy-duty eyelets. Having endured the process of mastering the structural type at a small scale, thus proving that the principles actually work, students would then be confronted with more practical problems such as how to prevent cables from slipping, manoeuvring a completed structure without distorting it, or realising the sheer weight of a card geodesic and therefore the challenges of suspending it [Figs 7 & 8]. Figure 7: Bolts, inserted through drilled holes, enable this card geodesic structure to retain its form. Phase two of this project was for students to illuminate the structure; the interior of this geodesic can be glimpsed on the right side of the image. Figure 8: Suspended, geodesic structure, made of laminated card, illuminated with a single LED colour-change lamp. This is a project which shakes up preconditioned practice in the studio. It requires little drawing, other than the creation of patterns and templates, and research is done to a practical end, rather than a theoretical one. Very able students can struggle with it, while others can present themselves in a new light – they can become the team leaders, the liaison with technicians, the problem-solvers, the communicators. Figure 9: Design review, 27 November 2017. UWE students present to UCA students, who embarked on the project the following semester. What was especially interesting was the way that students conducted themselves during the design review, held on 27 November. During a typical review, students will present to staff and frame their work in terms designed to impress those reviewers. This review was different. Because students from UCA would be undertaking the same brief the following semester, they too were present. Without being prompted, UWE students presented directly to our visitors from UCA [Fig. 9]. Reviewing staff, seeing what was happening, retreated and merely observed. 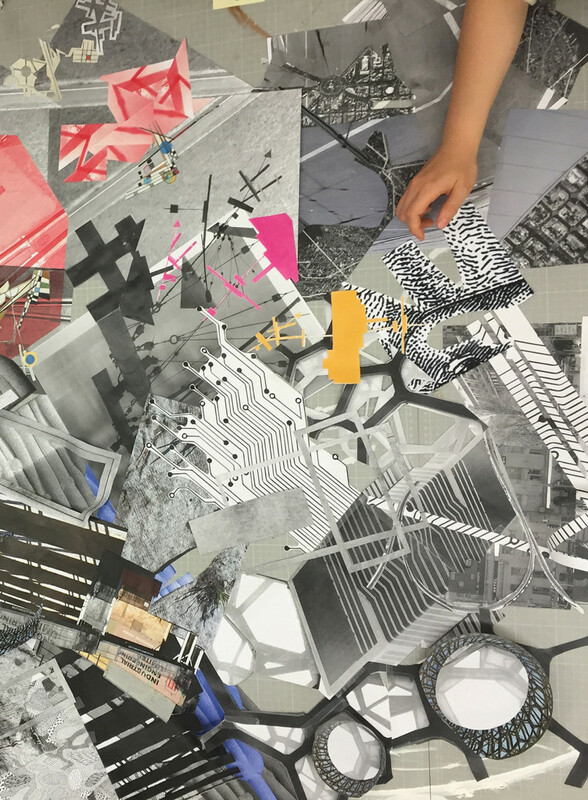 UWE students were more honest than one would expect from a design review – learning was shared; mistakes highlighted; the pros and cons of material choices were made clear; anecdotes were told. UCA students asked good questions, not out of general curiosity or good manners but because they, soon, would be undertaking the same brief; and UWE students answered with a directness one rarely sees during a process designed to present work in the best possible light. Figure 10: Geodesic structure, prior to the installation of triangular panels. Figure 11: Mark Gower, programme leader from UCA, enjoying a UWE geodesic during design review. I believe this candour originated from the confidence gained from conceiving and making such large and complex structures. The students had become the experts; and experts have the confidence to tell their story just as it happened, without the need for obfuscation, partial truths or redirecting your attention [Figs. 10- 11]. Possibly other projects might be considered in such a way, in that projects be passed on like an educational relay. It might provoke more soul-searching and honesty from those who have completed the task, and maximise interest from those who are yet to undertake it.